As people close to the case revealed to CargoForwarder Global, DUS Cargo has been audited successfully by external experts last week and will therefore join the exclusive CEIV Pharma club once the DUS management at the WCS confirms the result of the thorough inspection. It is noteworthy, that the air freight arm of Dusseldorf Airport will become the first CEIV Pharma applicant in Germany that’s been awarded the certification, with Rhine-Main operator Fraport and LH Cargo standing in line and whose qualification program is currently under way. 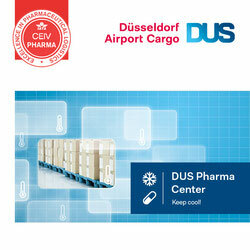 By joining the exclusive CEIV certified circle, DUS Cargo can expect to capture larger parts of pharma shipments produced more or less next door in the State of North-Rhine Westphalia where Dusseldorf is the capital city. Up to now, most of these locally produced consignments are trucked to AMS or other major hubs where they are consolidated and flown out, thus circumventing nearby DUS. These flows might change direction now due to Dusseldorf’s extensive route network, meanwhile encompassing 190 destinations worldwide and foremost because of the CEIV pharma certification of the airport’s cargo arm. In addition, local sources point out that North-Rhine Westphalia is home of a burgeoning pharmaceutical industry, that accounts for 10-plus percent of all pharma exports leaving Germany and 12 percent of imports. In total, 16 percent of all pharmaceutical companies doing business in the country are based in the highly industrialized western German state with Bayer Leverkusen being the most prominent. 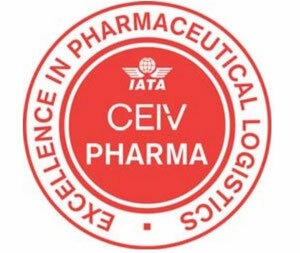 IATA created CEIV Pharma was set up to improve the level of competency together with operational and technical preparedness to stop mishandling of shipments through ignorance or lack of special knowledge and stop the alarming decline of air cargo’s market share of global pharmaceutical product transport. It was launched in view of repeated cases of wrongly handled shipments by ground staff at airports or warehouses or falsely documented consignments through lack of knowledge causing damages running into the millions. A second reason for IATA’s initiative to set up their pharma excellency program was the modal shift from air to ocean, which hurt the entire air freight industry. According to Pharmaceutical Commerce Magazine, the pharmaceutical cold chain logistics industry will surpass the $10-billion mark in 2018. Traditionally, this industry has relied heavily on air transport due to its speed and efficiency. 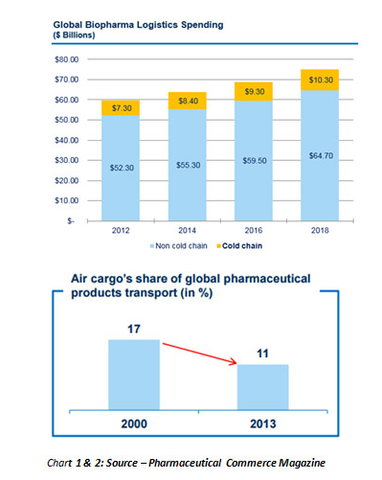 However, over the past decade, air cargo’s share of the overall global pharmaceutical product transport has been continuously declining. The use of air transportation is reconsidered given the current amount of annual product losses in air transport (up to US$12.5 billion) and the current trend towards improved reliability in ocean freight. The industry identified a need to build a network of certified pharmaceutical trade lanes that meet consistent standards and assure product integrity. As a result, IATA has taken a leading role in supporting the air transport industry to comply with pharmaceutical manufacturers' requirements. By pushing ahead the Center of Excellence for Independent Validators in Pharmaceutical Logistics, IATA intends to help organizations and the entire air cargo supply chain to get on the right track to achieve pharmaceutical handling excellence. Under the program, applicants have to undergo training, as well as an assessment of their facilities and operational processes by independent, IATA-certified auditors to ensure their compliance with IATA-set requirements on pharmaceutical handling before being admitted to the club. 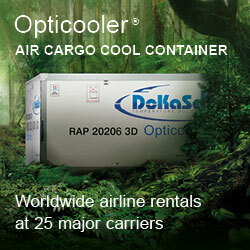 The program aims at safeguarding product integrity while addressing specific air cargo needs. It encompasses standards and guidelines such as packaging requirements of shipments, the provision of sufficient cool rooms at warehouses, appropriate qualification of the handling personnel at warehouses, airlines or freight forwarders involved in the pharma and healthcare supply chain together with other specifics. “The more ground handlers and forwarders become CEIV Pharma certified at one location, the better for our business,” stated head of cargo Steven Polmans of Brussels Airport when receiving the certificate in 2014. The overall goal is to elevate the industry know-how and achieve global standardization, states IATA.